The Official Standard for The Louisiana Catahoula - The State Dog of Louisiana. 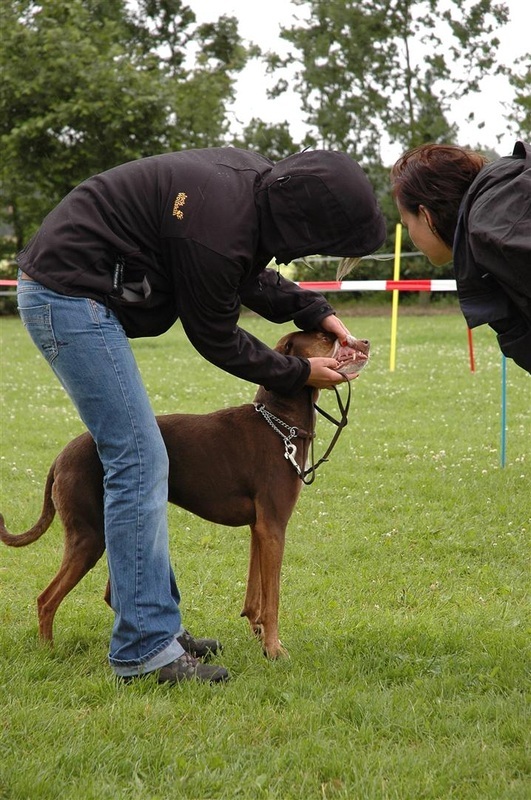 exaggerations or faults should be penalized in proportion to how much they interfere with the dog’s ability to work. The head is powerfully built without appearing exaggerated. Viewed from the side, the length of skull and muzzle are proximately equal in length, and joined by a well-defined stop of moderate length. The planes of the topskull and the bridge of the muzzle are roughly parallel to one another. There may be a slight median furrow between the eyes and running back to the occipital bone. Gender differences should be apparent in the characteristics of the head. SKULL - The skull is broad and flat. The cheeks are well developed. MUZZLE - The muzzle is strong and deep. Viewed from above, the muzzle is moderately wide and tapering toward the nose. Lips may be tight or slightly pendulous with pigment of any color or combination of colors. TEETH - The Louisiana Catahoula Leopard dog has a complete set of evenly spaced, white teeth. A scissors bite is preferred, but a level bite is acceptable. Full dentition is greatly desired, but dogs are not to be penalized for worn or broken teeth. NOSE - Nose pigment may be any color or combination of colors. EYES - Eyes are set moderately well apart, medium in size, somewhat rounded in appearance, and are set well into the skull. Eyes may be any color or combination of colors without preference. Eye rims are tight and may be any color or combination of colors. EARS - Ears are drop, short to medium in length, moderate in size, and proportionally wide at the base, gradually tapering to the slightly rounded tip. They should fold over and be generally triangular in shape. The top of the ear fold is level or just slightly below the top line of the skull. When the dog is at attention, the inner edge of the ear lies close to the cheek. Laid-back ears are acceptable but not preferred. NECK - The neck is muscular and of good length, without being overdone. The circumference of the neck widens from the nape to where the neck blends smoothly into the shoulders. FORELEGS - The forelegs are straight, and of medium bone, indicating strength without excessive thickness. Pasterns are strong, short and slightly sloping. 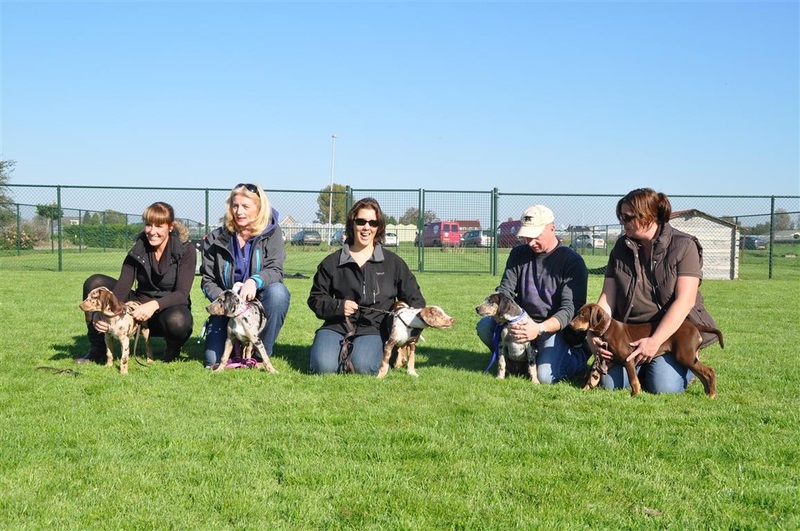 The length of the forelegs should roughly equal 50-60% of the dog’s height at the withers. A dog with legs shorter than the ideal is to be more heavily penalized than a dog with longer legs. 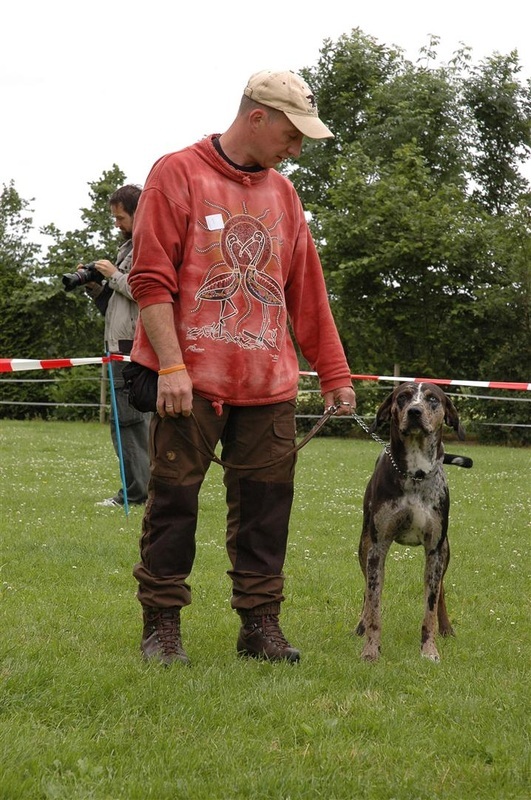 A properly proportioned Louisiana Catahoula Leopard dog is slightly longer than tall. The top line inclines very slightly downward from well-developed withers to a level back. The back is broad and well muscled with a short, strong, slightly arched loin. A slightly longer loin is acceptable in females. The ribs extend well back and are well sprung out from the spine. The chest is deep, reaching at least to the elbows, and moderately broad. When viewed from the side, the fore chest extends in a shallow oval shape in front of the forelegs. Tuck-up is apparent, but not exaggerated. Croup is medium to long and slightly sloping. A slightly elevated rear resulting from slightly straighter rear angulations should not be penalized too severely. Faults: Chest too broad, too narrow or too shallow; soft top line; exaggerated or absent tuck-up; loin too long. Hindquarters are strong and smoothly muscled. Width and angulations of hindquarters are in balance with the forequarters. HIND LEGS - The stifles are well bent, and the hocks are well let down. 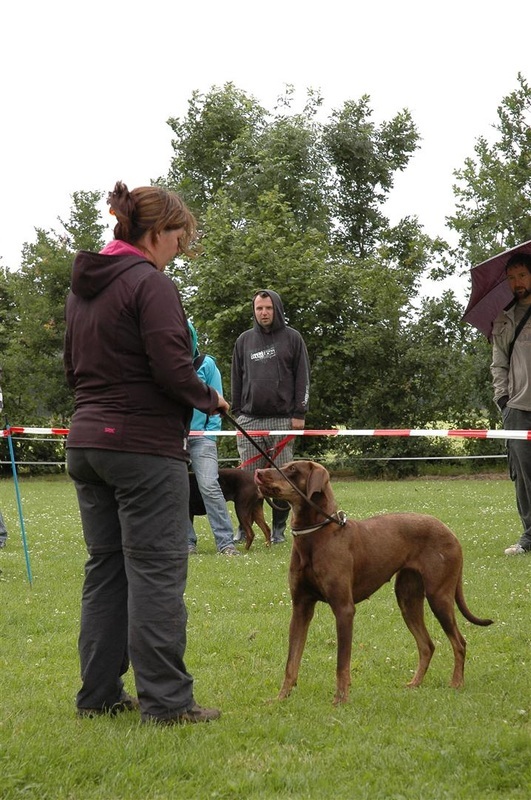 When the dog is standing, the short, strong rear pasterns are perpendicular to the ground and, viewed from the rear, parallel to one another. preferred. The natural bob tail, regardless of length, will taper in width from base to tip. 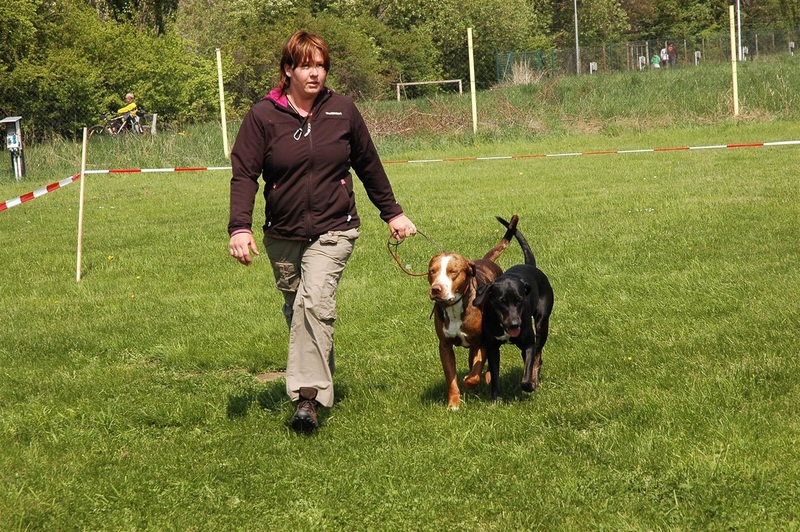 A full length tail may be carried upright with the tip curving forward when the dog is moving or alert. 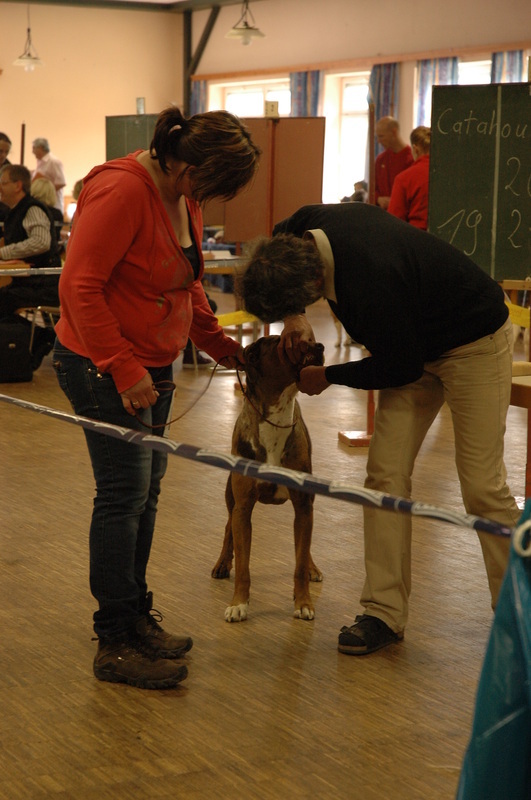 When the dog is relaxed, the tail hangs naturally, reaching to the hock joint. 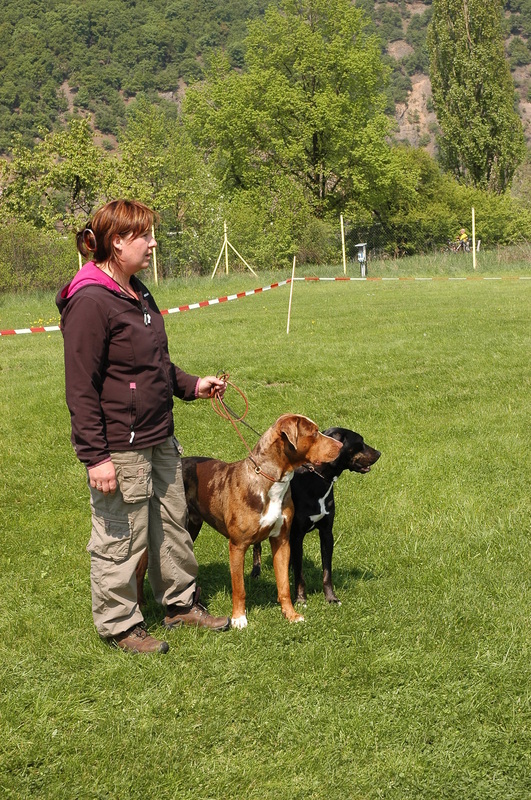 Catahoulas should be allowed to carry their tails naturally when being shown. Exhibitors should not hold tails upright. the correct proportion of weight to height. Catahoulas should always be presented in hard, working condition. Any deviation from the ideal must be judged by the extent of the deviation, and the effect it has on the dog’s ability to work. When trotting, the gait is smooth, fluid and effortless, showing good but not exaggerated reach in front and powerful drive behind. The top line remains level with only a slight flexing to indicate suppleness. Viewed from any position, legs turn neither in nor out, nor do feet cross or interfere with each other. As speed increases, feet tend to converge toward center line of balance. 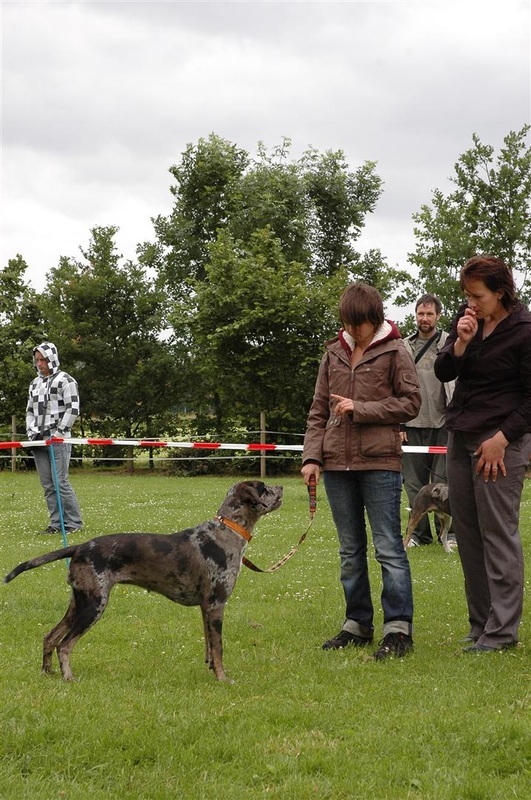 Poor movement should be penalized to the degree to which it reduces the Catahoulas ability to perform to do the tasks were it was bred for. 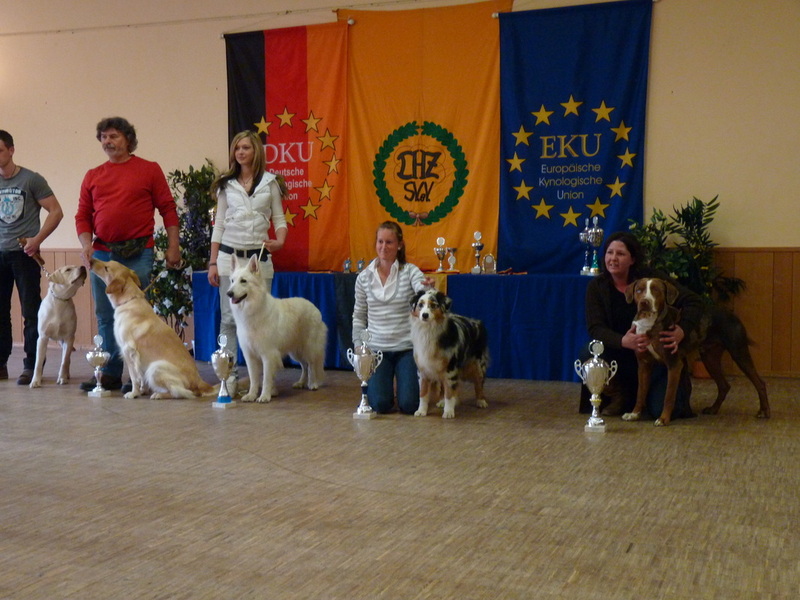 Best of show in Austria 2010! Troy and Ziva Couple class. Skochovice Czech Republic 2011. Fair Mate's Aydin-Sookie. 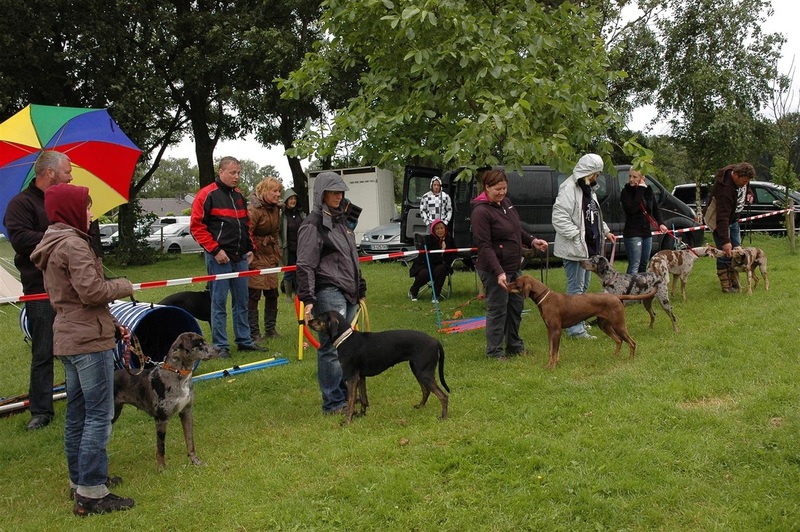 First time show Catahoula weekend Netherlands 2012. 6 females is junior class, 2012 Netherlands. All first time show. Dental check. Besavej's Arisa- Mette. Netherlands 2012.